Imagine if you took the amazing cleaning power of grapefruit, combined it with the kazowwy wowwy magic of baking soda and added in some supercalifragilistic borax? What would you get? WHAT WOULD YOU GET? This blessed little cleaner came about quite by accident. See, I bought this juicer for Christmas and have been a little overboard on the grapefruit juice. One day, instead of putting the grapefruit pulp on the compost pile, I plopped it in the sink. The sink, by the way, is a white porcelain, and since I moved into this beautiful place, it’s been stained beyond measure. I swear, if you even hover a cup of coffee over it, it turns brown and starts laughing maniacally. I sat there looking at the grapefruit and thought, “I wonder what would happen if I mixed in borax and baking soda and just mushed the grapefruit all around the sink.” So I did. And lo and behold, upon rinsing, the sink was a shiny, pristine white. Like I’d never seen it before. Then I looked at the grapefruit peel, again at the sink, and stuck my tongue out and told it that it would never get the best of me again. So, originally I created this scouring scrub for my sink, but it turns out that it’s fantastic for cleaning just about anything. Think of it as sort of a nontoxic Comet, if you will. The first thing you need to do is buy a grapefruit, peel it and tear the peels into smallish pieces. It took my grapefruit peels about 3-4 days to dry completely. The reason why we’re not putting them in the oven on low to dry is because we don’t want to damage the essential oils in the peels. It becomes this very nice, fine powder that’s really soft to touch, which surprised me. I expected hard, gritty beads. But no. It’s the perfect consistency. This is when you create your scouring scrub. And here is everything you need. Three ingredients. Cleaning doesn’t get much more simple than that, does it? Combine everything in a shaker (like an old parmesan container) and shake well to combine it all. Use liberally wherever scouring is required. Be sure to rinse the scrub off well with a clean, wet sponge. Here’s what the results look like, after you’ve combined everything completely. It’s a pretty, pretty color. But, even better, it SMELLS LIKE HEAVENLY GRAPEFRUIT. I was surprised by this development, as well, because before I ground the peels, they didn’t smell like much of anything at all. You can use it on counters and bathtubs, stainless steel and sinks. I used mine on just about everything, and it works like a charm. Here’s how I’ve been doing it: Just sprinkle a little bit of the scrub on the surface you want to clean, and then take a wet sponge and scrub over it. Rinse the sponge well and go over it again. If there’s still scrub left on the surface, wipe it off one more time. It’s very important to get all of the scrub off, though, because borax is a beeyotch to get off once it dries completely. If you’re cleaning a hard-to-sprinkle-surface (like a toilet), just sprinkle some of the scrub onto a wet sponge and go to town. The recipe mentions using an old, washed, reused parmesan cheese container. That’s perfect. However, if you want something a little more fancy (or if you don’t eat bottled parmesan cheese), find a tea tin or something similar and decorate it a little bit. Then, just punch holes in the top of the lid with a nail and a hammer. Please note, I am not very good at spacial reasoning. That is the best I could do in terms of a circle of holes. It is a little sad, but it works. Yours can be sad, too. Imperfections are what make our creations beautiful. Or something. 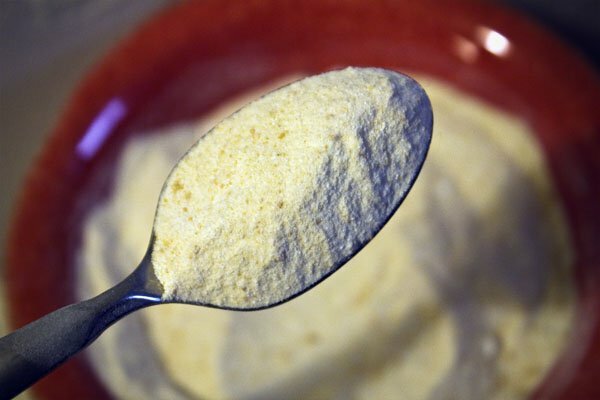 Citrus Peel Powder – What’s Next? So I have five orange peels and another grapefruit peel drying at the moment. I’ve already decided I want to make a facial scrub with the grapefruit peel. It’s BEGGING me to do this. However, I’m curious if you guys can come up with something else to do with powdered orange peels. I know there’s no reason to powder them, if there are no other ideas. So, barring powdering them, can you think of other things to do with dried citrus peels? FYI, if you’re curious at all about Borax and haven’t read the post on Crunchy Betty where I get to the bottom of it, here it is. Love this recipe! And now I’m gonna save my grapefruit peels as well as eggshells and random vegetable bits (stock). My roommates thank you! …also, could you add some citric acid and make a ‘bath bomb’ then put it down the garbage disposal? With vinegar or water to activate… kind of like the drain volcano you mentioned but with extra fizzing and cleaning and freshness. This is GREAT. I’ve been eating a lot of grapefruits lately and am saddened to throw away all of those delicious smelling peels. Going to give it a go. Thanks. I recently read somewhere (i can’t remember where) that you can peel a clementine or tangerine… try to keep the peeling whole or as whole as possible, and insert a tea candle to have clementine/tangerine scented candle or something like it. I’m sure it would work with oranges or gratefruits too. Buy the way, I love your website. You’re a great writer and you crack me up… such a pleasure to read. I crowd-sourced a list of uses for citrus peel, and the good ideas keep coming in! I’m adding yours to the list: I, too, have a PITA white porcelain kitchen sink. I also use the fresh citrus peels to flavor my water kefir in one round (scrape pulp off first). I’ve been known to rub that pulp on my skin in various places where I have some freckles or other discolorations. 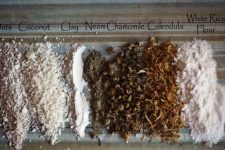 It is said to lighten those areas naturally, which is actually why I got the idea to add the ground version to my face mask mix. Apparently, it has been working because people are commenting on my skin. I also throw the peels in the garbage disposal for a fresh scent that lingers in the kitchen for awhile. A neighbor shared that a plumber told her it is very bad for garbage disposals, so I haven’t done this as often as I used to do it (used to be EVERY citrus peel). I don’t if it is true or not. Sometimes I rub the pulp side of the peels all over the kitchen sink before tossing them down the disposal and running it. Sparkles things up! Orange Peel…assuming that you’re using organic citrus…what about making Orange Salt? That would be a nice thing to have hanging around the kitchen. Check out 101Cookbooks for her recent posting on Citrus Salt. I’ve actually bought orange powder from a supplier before, to add to bath bombs, facial masks, and scrubs. Since that time I’ve considered drying my peels and making my own botanical extracts. Tailor the grind quality to your use. Mom always uses her leftover citrus peels as a kitchen deodorizer after making some smelly but delicious concoction – get a small saucepan and fill with 1-2″ of water, add citrus peel, a cinnamon stick, and a few cloves. Heat over medium-low for a lovely citrusy kick. Add to homemade (or store-bought!) potpourri, with some cinnamon sticks, star anise, cloves, or whatever blows your skirt up. And you can always add some to your body scrubs for a wake-up feel and smell. We lived on a farm,so “Lava” was the usual soap of choice…by her! I wanted the soap that ‘floats’! Very expensive-it was a ‘treat’!! Thanks for my lil’ therapy here!Ha-ha!! Happy smells, shiny faces,sinks,whatever to u all! I’m from Trinidad & Tobago in the Caribbean, and we never really throw away the peels. We also save them to add to cakes (just a few bits in the batter adds wonderful flavours – just be sure to take them out before u bake, or you can use a bit of the powdered peel instead so you don’t have that worry). There’s also candied peel (I’m not fan, doesn’t mean you won’t like it though). Unfortunately I don’t have a recipe for that, so you can probably ask Google. 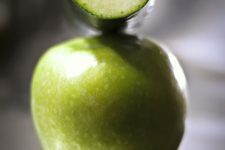 You can candy them for a tasty treat or as garnish on cakes and pies. We usually stick ours in the garbage disposal to make our kitchen smell fresh and clean. I have to try this cleanser now. We have an old 1960s porcelain sink and it’s just dreadfully dirty. Powdered orange peels should have the same effect as grapefruit. We put lemon or limes peels in our garbage disposal. Also you can run it on the underside of the rubber flap (that keeps everything down in the disposal) to clean it up before you run them through the disposal. Thank you for this recipe. You seem to have the perfect timing with your ideas…It must be that great minds think alike! haha. 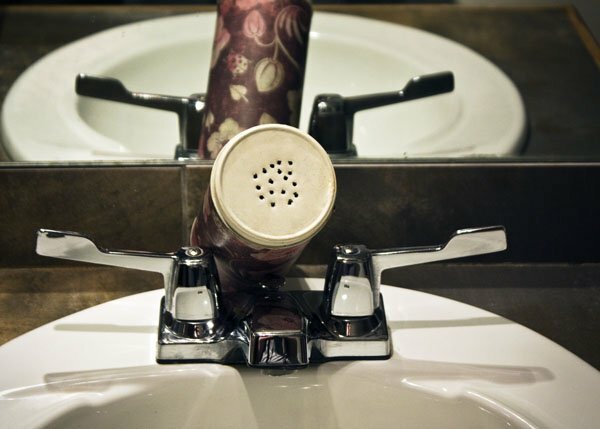 I have an old sink like you described…must try it! going to buy citrus now! This is a fabulous idea! Love your posts and look forward to each one. 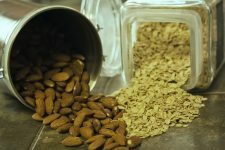 Although I’m new to the world of homemade natural products, I’m intrigued by all of the great possibilities for them. I’ve practiced eating/living healthy and organic for many years, but had not thought about the healthy home aspect, or making products myself. Your extensive research for your posts is informative, well written, and takes the scary mystery out of the process and use. And, you make me laugh and brighten my day! Thanks for the best tips ever! After a recent round of making Orange Marmalade I had a big bunch of orange peel ends leftover. I soaked them in white vinegar to use for cleaning. I like to use white vinegar for that and sometimes would add orange essential oil to it. Orange is a great degreaser. So when I saw all these I thought….hey dont have to use expensive oil, just use these up. I also add it to my dishwasher now and then to clean it up and make the dishes sparkle, leaves a nice orange scent too. But then I thought ooooo wouldnt a nice orange vinegar be good on salads? So I added some to some cider vinegar. Its yummy. But I also just zest the peels and dry them on a plate. Then I store them in a jar in my baking cabinet. This way I can add orange flavor anytime when I bake…how often do you want to use it and dont have any in the house? So I save it for those times. The stores sell Lemon Pepper but if you have this around why not make your own? Orange Pepper , grapefruit pepper,,,,,,lime pepper ….or salt. Awesome on grilled foods and adds a lil kick to a finished dinner. The meyer lemon tree went crazytown this year, so after buckets or marmalade I have a bunch of dried rinds. I also do the white vinegar soak and use it for all my cleaning needs, especially the floor. I recently got a puppy and she turns into a jackal from wild kingdom or something when she is at the dog park, but a single squirt of the watered down citrus vin. settles her pants nicely. I think the small bit of vinegar in the water gives her the olfactory clue for training, as well repelling fleas. P.S. ….try adding some to coffee when you brew it. You wont want to use cream or milk in it then but the flavor is awesome. I love my coffee with orange peel in it. But Italians use a twist of lemon with their espresso too. Hi Pat, when you add the peels to your dishwasher are they in powder form or do you just throw them in as is? Also are they soaked in the vinegar too? Thanks for your help! What a great idea…we have been having grapefruits for breakfasts for weeks now and I have been throwing the shells in the compost bin….this is an awesome way to use all of the fruit!!! I don’t have any grapefruit on hand, do you think it will work as well with oranges? I use the orange/lemon peels to infuse vinegar (for cleaning and also hair rinse after BS), herbal tea, and cooking. My husband stretched some leftover screen material over two old picture frames for me (staple underneath) and I dry all sorts of plant material on these! Citrus peels will mold if they are not in a single layer with plenty of air circulation (at least in my house). The screens work beautifully! Nice recipe! Just yesterday I mixed baking soda with pink grapefruit and lemon essential oils as a carpet refresher. I sprinkled this on my carpets and left it there for 20 or so mins. before vacuuming. Made the house smell so fresh and lovely! I wonder if the result will be the same with the peels instead of EOs. I might just give it a try. You could also try infusing the peels in a light relatively unscented oil like sunflower or safflower for a nice body oil. I bet that would be yummy. Last night I pulled a ton of grapefruit peels out of the dehydrator. I ground them up in the Magic Bullet. Then I added some oil and sugar and wha-la Grapefruit Sugar Scrub. I took a handful of jars to work and the chicks were soooo excited! This stuff smells and feels t-riffic!!! Someone asked if she could put it on her ice cream. Why….did all the chocolate in the world disappear? Remember the baking soda dry shampoo? What about adding some orange peels? I wanted to try it out myself right now, but the thing is that my grinder is broken. Two recipes on my list of things to try is a grapefruit juice facial toner (grapefruit juice with witch hazel) and a grapefruit juice facial scrub. 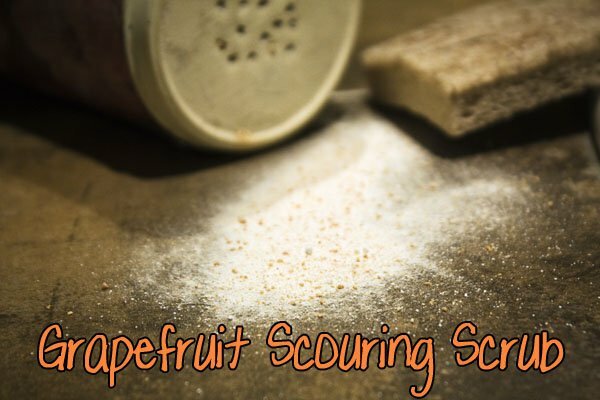 The scrub recipe I found is just ground oatmeal with grapefruit juice, but now I think I will also add some ground grapefruit peel for some extra grapefruity scrubby action. I use fresh lemons and limes a lot when I cook and I’ve always hated throwing away the peels, but I didn’t really know what else to do with them. One thing that I think is really amazing about this blog is all the great ideas shared by all you wonderful crunchy people. I have a lot of vinegar infusing and peel drying and grinding to do! 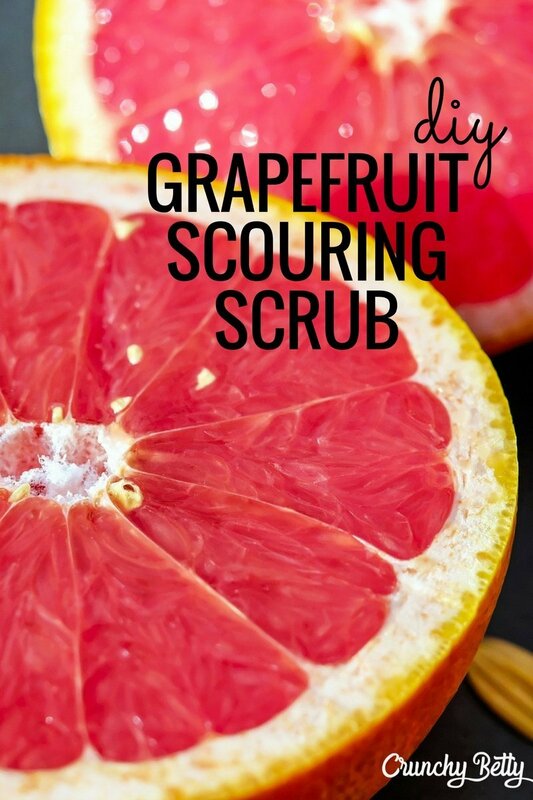 What would happen if I added the grapefruit powder to my everyday scrub? Would it be too hard on my skin? I love the ground oat and almost daily scrub and I like to jazz it up with a little something extra. This batch I decided to add a little bit of cinnamon, but if the grapefruit won’t be too harsh then I’d like to add it next. Any thoughts? Could I do it? I have been making my own CP soap for more than a decade and have used the ground peels as an exfoliant. you should be careful saying “non-toxic”! borax may not be acutely toxic, in studies done on rats at least, but the lethal dose to an adult human has not been determined, but exposure to the dust (i.e. sprinkling it around) can cause respiratory issues – we always wore a mask and gloves when mixing borax to use as flux when I was repairing jewelry. And on infants it is DEFINITELY toxic and can cause severe developmental damage by exposure, specifically on abrasions or in delicate membranes like the eye. I’m so glad I read your comment. I was thinking I’d do the borax/citrus carpet refresher tomorrow, but I have a 14 month old. 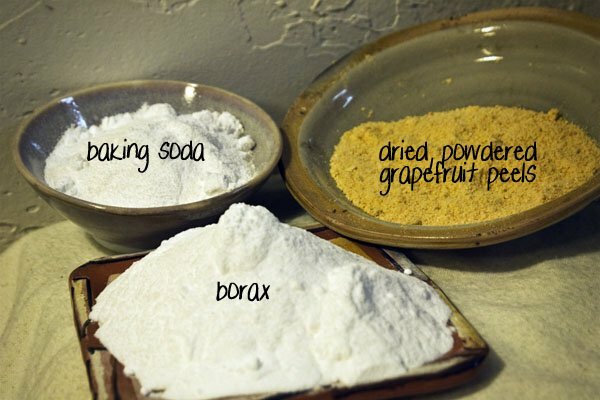 So, needless to say I won’t be sprinkling borax all over the house now. Thank you. Wait. I JUST read this (don’t know how I missed this the first time), and I’d love to see the studies that show that borax can cause developmental damage to infants with exposure to abrasions. I spent many, many months researching all the potential issues with borax (as opposed to boric acid, two different things) and this is the first I’ve heard of this. Can you point me in a direction to learn more about this? Something I would DEFINITELY want to understand more about! I remember reading ages ago that the inside of an orange peel…the white bit…is good for whitening your teeth a bit. Could be a good toothpaste or just a one off teeth cleaner. I could do with one of those!! I am so going to try this! It just so happens that it’s grapefruit season and I picked a TON off my grandparent’s tree yesterday. Hooray!! I’ve always used my citrus peels in the garbage disposal – cleans nicely and smells wonderful. I am totally LOVING your idea…I will not dispose of them all. Could I just use baking soda and grapefruit peels? I don’t have access to borax here. I can’t wait to try your recipe as soon as I can get to the store to buy some grapefruit! Thanks for the great idea! So we can use any peel then? I’m going back to Colombia and we dont have grapefruit there. Can anyone tell me if orange will work with it? Many thanks, Great idea!! Clean your microwave! (Yes, I use one, please don’t anyone get all crunchier-than-thou). You know when it gets all nasty crusty because you’re too busy living to clean it? Throw some peels in a cup of water and turn it on high for about 2 minutes…when it’s done all that gunk will magically wipe off. So cool. FYI- I dried some grapefruit peel a few days ago, ground it up in my coffee grinder, and decided to add it to the basic body scrub that CB talked about in the 40 homemade gifts blog (for men’s gifts)….and it smells and looks AWESOME! Can’t wait to try it out. If it’s as winning as I think it’s going to be, the next batch is going to my boyfriend for part of his V-day gift. Thanks for the idea! P.s. I got some awesome facial scrub as part of my Crunchy Community Gift Exchange over Christmas, and I might add the leftover grapefruit “powder” to it! Orange peels… Carpet freshener… I put fresh sliced peels in borax, sometimes I combine different citrus fruits, adding lime makes smell great! I put 3c borax in container with lid, like a food storage container. Then add peels from citrus. Put lid on, shake every few hours to distribute. Let sit overnight or longer, put lid on. Next day remove lid fish out peels. Let sit open few hours to dry out a little. I sprinkle on carpet when still a little damp and let it dry out/ absorb dirt, the rest of the way on the carpet. You can use dry too. Few hours and vaccum thoroughly. Carpet will look refreshed and smell amazing. I am going to try what you did with letting peel dry out and grinding it to powder and add to borax or soda for carpet smelly good. That was a wonderful tip. Thank you! I saw this on Pinterest today and remembered that you had asked for suggestions using powdered orange peels. This face mask uses dried orange peels. I’m very curious to try this myself. I have been having a blast drying my grapefruit peels and now lemon peels … I’m going to make up some cleanser as soon as I restock my Borax. I love the smell when they are drying and love to open the jar of ground peels just to smell it! I’ve made a creative centerpiece for my peel drying and baked a from scratch pumpkin spice mini cake to put on top! By the way … I Love your Blog and since I’m a “Make do … Use it up … Wear it out …or do Without” kind of gal … I’m finding lots of helpful and entertaining information. Just found this site a few days ago and love it! I can’t wait to try this on my porcelain sink — it’s impossible to keep clean. I also use citrus peels in the garbage disposal or simmer with a cinnamon stick in a bit of water for a wonderful smelling kitchen. I have also used the ground peels in cold-process soap as a gentle exfoliant. It’s great! But can you do it without baking soda, so just salt and peels? And lemon is also very good and smell nis too. I like the way you think and write very much. Thanks for caring, sharing and being so real! This is actually such good kismit, i am in the process of changing over most of my cleaners to natural ones and comet is one that I love adn havent been able to find a natural version of. Have the same coffee stained white porcelain sink and am going to run to the store for a grapefruit!!! I know this is an old post, but I just found it, and I’m very excited to try this! And I soak my orange peels in white vinegar in a mason jar on the counter for a couple of weeks, and presto, I have delicious smelling orange vinegar. This is good for cleaning, but not so good for washing windows; it seems to leave a smeary residue. Sure smells better than the regular stuff though. I was just going to copy the recipe…but so enjoyed your preamble I had to copy the whole thing. Look forward to using grapefruit for all…I have access to a gazzillion of them from neighbor hood trees, never sprayed trees tooo!! I wonder if this could be used in making enzyme cleaner, especially in making one that will last longer than a few months (because enzyme cleaner is usually made with fruit still attached to the peels).